thanks to some wise advice given by their new coach (played by Neeraj Sood) – we now look forward to seeing the other rivals they’ll need to face this season! Both the Chonkpur Cheetahs and Chellapuram Cheetahs (Tamil Nadu, Karnataka, Andhra Pradesh), will be seen on our TV screens through this cricketing season, and we’ll be able catch-up with more of their journey through the new city on Digital platforms. With everyday obstacles out of the way thanks to Apni Dukaan, can anyone really stop these Cheetahs from fulfilling their dreams this cricketing season? There’s so much to still unfold… let the games begin! 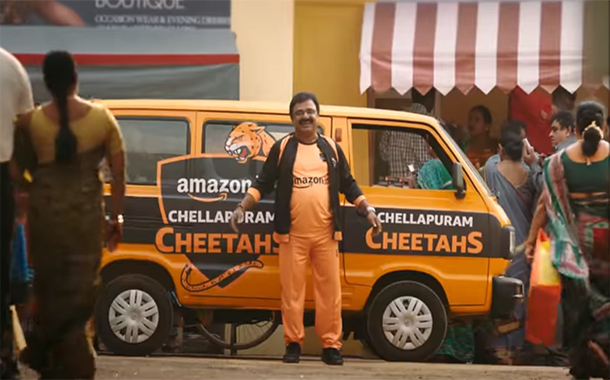 Ravi Arun Desai, Director, Mass and Brand Marketing, Amazon India: With more than 300 Million interactions across touch points in 2017, Amazon had to bring back the Cheetahs in 2018, this time chasing a bigger dream in an ‘Ajnabi Shahar’. The insight behind this campaign is that almost all Indian families have someone who would’ve moved to a big Indian city in pursuit of ‘better opportunities’ for themselves and the next generation. The campaign encapsulates how Amazon supports millions of Indians in their pursuit of dreams, as we cater to their everyday needs. Our customers use Amazon to effortlessly settle down in a completely new environment. The campaign explores a few relatable stories of the Chonkpur Cheetahs trusting apni dukaan to help them tackle some problems of settling into an unknown city. With over 17Cr products to choose from, the obstacles are taken care of by Amazon.in, and all they now need to do is concentrate on fulfilling their dream. Azazul Haque, Executive Creative Director, Ogilvy Bangalore: When we conceived the idea of Chonkpur Cheetahs last year we created an entire team with characters that would feel completely relatable to any individual who saw it. Their journey started as a team with a big dream – and this year that dream takes them to an unknown big city. This journey is inspired by the millions in India who shift to unknown cities to fulfil a lifelong dream regardless of the challenges they may have to face. Amazon.in here is everyone’s ‘Apni Dukaan’ that helps tackle these challenges, so that the dream can flourish. Kiran Ramamurthy, Senior Vice President, Ogilvy Bangalore: With the launch of Chonkpur Cheetahs last year, Indian audiences came across a team that had potential, but whose dreams of playing in ‘T20’ matches was restricted by their ability to get things that they needed. That is, till Amazon came into the picture and helped them realize their potential by removing the obstacles of access to things they needed. This year, with an improved game, the Cheetahs land in a big city to progress in their careers. Not surprisingly, when they are confronted with the problems of settling in a big city, it is again Amazon to the rescue. Like always, this campaign is a story of a progressive group of Indians who are focused on the task at hand and how Amazon helps them overcome some of the structural barriers that we face in our daily lives. Conceptualized by Ogilvy Bangalore and directed by Hemant Bhandari of Chrome Pictures (Chonkpur Cheetahs) Jerald Packiasamy of Still Waters Films (Chellapuram Cheetahs), the films bring to life charming stories of people settling into new cities, and how Amazon India can help by providing access to required products in a humorous and light hearted way. The campaign is led by multiple TVCs through the course of cricketing season, amplified through an integrated campaign spread across Digital, Social, Cinema, Radio, and more.